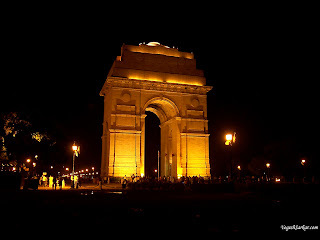 A Tour to New Delhi the Capital of India. A capital for many kingdoms. New Delhi the Capital of India is one of the oldest Cities in the world, so many Kings, emperors and rulers flourished and perished in this city with a very long history. Some of the rulers have left some traces to history as palaces, monuments and mausoleums for the future generations to see; others just ruled and got vanished without a trace in the ocean of time that always kept ticking. There are two Delhis the old and the new. As the names suggest the old was the place for the erstwhile emperors with narrow allies filled with stores and vendors where as the new is for the modern emperors by name politicians dotted with palatial buildings, broad and well maintained roads and crowded and expensive malls. The modern day Delhi (New Delhi) has many landmarks like the awe inspiring India-Gate, The Indian Parliament House (a building built utmost aesthetically in a characteristic style) Raisina Hill (where the President of India resides- Rashtrapathi Bhavan) and the North Block (where the Indian Prime Minster lives) and South Blocks, where the ‘people with power’ live. Raj Ghat and related locations. The city is as crowded as any other mega cities with millions of vehicles bustling through the busy streets, but New Delhi still keeps its grandeur close to its chest –as a place which has been abode to numerous emperors it seems only a natural proposition. The bank of River Yamuna (the main tributary of the holy River Ganges which passes through Delhi) is still cool and green and fit to be nostalgic. Vijay Ghat (platform of victory) is the war memorial for the memory of India’s war with Bangladesh. Shakti-Stal (place of strength) is place for Mrs. Indira Gandhi two times India’s Prime Minister; known for her determination and will power. Veer Bhumi (land of courage) is the memorial for Mr. Rajiv Gandhi who was behind the technological revolution that India has achieved. There is a huge lotus (word rajivam means lotus in Sanskrit) carved in stone surrounded by 46 small lotuses (he was assassinated at the age of 46) all these are inseparable from the history of modern India and all Indologists are familiar with. There are many museums in Delhi most of them are worth seeing, come winter Delhi turns in the capital of cultural festivals and performing arts of all colors. The gardens and roundabouts are all overflowing with colorful flowers; they don’t just add beauty to the city but give a respite to the citizen from the scorching heat in which the city is engulfed. The pompous Republic Day Parade held on the morning of 26th January is a function that tells the world about the emerging powerful nation that is India. Millions of Indians watch it direct while the whole one billion odd population of the whole nation sees it in TV with pride. It is a wish of every Indian citizen to watch it in person. Delhi has the status of a budget shopper’s paradise, most of the products are available at very competitive price and visitors to Delhi often return with bagful of electronic, foot-wear, hardware and textile as well as jewellery items. Chandni Chawk (moonlit street) is well known for the silver ornaments, and embroidered fabrics (saris and churidars) they sell. Old Delhi (where emperors had their palaces as well as mausoleums) is also known for the delicious food items. Parathas with Thanturi chicken are the most common items, where as hot chicken and mutton jelly like curries are more suitable and matching with parathas, vegetable curries also are there for the vegetarians). The stores selling glass as well as silver bangles rub shoulders with numerous restaurants which sell food delicacies. Parathas are Indian delicacies made of whit wheat-flour soaking it in water with some butter-oil, salt and keeping it for about two hours covered by wet cloth. The dough is then made in to small balls of about 50 grams and beaten flat with bare-hands and struck on a clean table -applied with oil- as if washing cloth by beating it on a stone! By sheer magic the dough becomes as flat as a newspaper! This ‘newspaper is folded zigzag and this ‘zigzag’ (in the shape of clock’s main spring) is again beaten black and blue and flattened. This flat substance is placed on a hot plate and heated until it is fresh and tasty. Connaugt Place in Pallika Bazar is India’s first underground shopping plaza. Delhi Tourism offers one-day sight seeing as well as shopping tours, which touches Pallika Bazar as well as its outside areas. A package of two day tour touching Agra Bharatpur and Jaipur also is available. Delhi being located at a main junction between main roads making it easy to travel to any part of the country by road, railways access is not an issue as there are numerous trains to all locations of the country; the international airport offers connectivity to all major air-ports of the world. Accommodation is also not a problem as there are chains of star hotels located here which has its braches throughout the world. At the lower end there are places in Lodhi and Central Court. A tour to Delhi can be a pleasure trip for sight seeing as there are numerous locations of interest for a visitor to visit see and understand. It can also be taken as an educational tour as visitors are able to see the old as well as new historical locations that played important roles in shaping the nation. A tour to Delhi can also be taken as a bargain hunting mission as there are products of good quality available at dirt cheap prices. The author remembers with delight about a time when Soviet Union was under the clutches of the communists and goods were scarce there. Innovative people of the erstwhile Soviet Union flew to New Delhi and ran to the markets from air port to Delhi markets and grabbed whichever they could buy. These materials were sold at higher prices at their country on big margin even after discounting the air-fare! Free sight seeing good food much cheaper and good profit on return!